All Suppliers - New Internationalist ethical shop. At Ocean Sole our mission is to turn flip-flop pollution into art and functional products to promote our oceans. We are a Kenyan social enterprise who focuses 100% on conservation entrepreneurship. 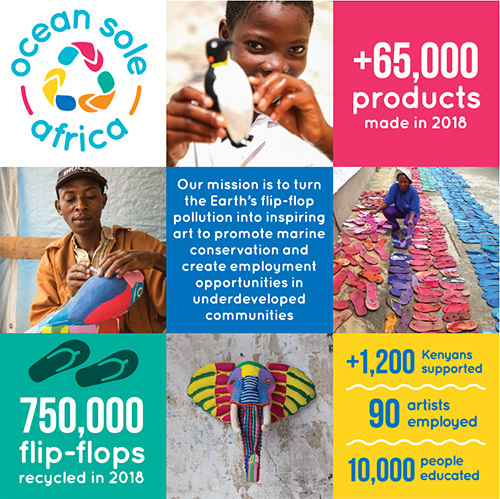 Since 2005, we have positively impacted many by (1) cleaning up over 1,000 tonnes of flip-flops from the Ocean and waterways in Kenya, (2) providing steady income to over 150 low-income Kenyans in our company and supply-chain, and (3) contributing over 10% of our revenue to marine conservation programmes. We make fun art so people, companies and charities remember that the Ocean needs our help. Our pieces represent the trash found in the oceans and waterways that are killing human and marine life in their journey from the dumps to the beaches. Our actions must make a difference to the plight of our Oceans. Our ethos is to give back what we earn to change the lives of many through education, income and meals. Our energy is focused on delivering fun products so humans don’t forget our marine life.